Image courtesy of robotGEEK'S Cult Cinema. If you use this image, give credit where credit is due. You can say I'm about as giddy as a kid on the last day of school right now. Browsing through eBay about a week ago I came across this and couldn't believe the price the seller had on it. $6.99. Yup, just $6.99 and a few bucks for shipping. The thing was that he or she didn't even have an actual photo of the case or tape, instead using a stock photo for the listing. But the description really caught my attention. It stated that this was the very first VHS release of Raiders of Atlantis done by Prism, the best version available on VHS as the subsequent versions released on VHS were Grade Z stuff. It also stated that it was a former rental in a clamshell case. 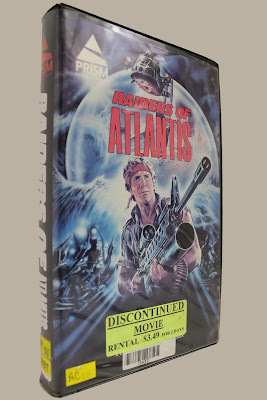 So immediately I assume it is one of those regular hard plastic cases where they took the cardboard VHS cover and cut it to fit into the case. Well imagine my surprise when I received my package today and opened it to find that this is the much bigger clamshell case, even bigger than the VHS clamshell cases usually reserved for Special Edition re-issues of horror films by Anchor Bay like The Evil Dead trilogy and the Demons films back in the 90's. And the cover art in this is specifically made, printed and cut to fit specifically by a manufacturer to fit into this particular larger size clamshell case. This much bigger package design more closely resembles the larger VHS clamshell cases from the late 70's to early 80's used for Warner Brother's films when released on VHS way back then. And to top it off, this thing looks brand spankin' new! Like nobody rented it ever! It has a few stickers on it as the picture shows, but the case, the vinyl covering the artwork, the glossy artwork and the tape itself are in near mint condition. The actual tape has the film's release date of 1983 by Regency Productions SRL, but it also has Package Design & Summary Copyright 1985 Prism Entertainment Corp. on the same label. The Packaging on the lower back says the same thing except it states the year as 1986 for the Package & Design Copyright. 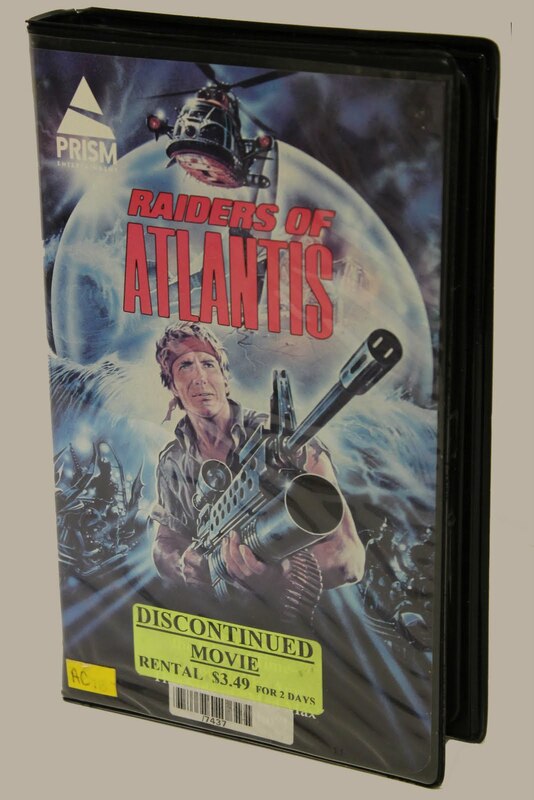 So I'm not sure if the tape itself and the package design are in fact the very first release by Prism or not, or if this is a special package design done exclusively for video rental stores. If anybody can shoot any info my way regarding this I'd be much appreciative. In any case, I'm an extremely happy man right now because for a measly $6.99, I got far more than what I was expecting. I can only assume that the seller didn't know what he or she had on there hands or just didn't care because if they would have included a photo of the actual item, I probably would've paid far more than what I paid for it to get my hands on this. This is absolutely one of my favorite films of all time and one of the best examples of Trash Cinema to come out of the 1980's. Never seen this film but I've heard so much about it, sounds like you got a real bargain. Do you know how much it would usually go for? You're telling me! I love finding deals like that! Let me know when you finally check it out too! Can't wait to hear your take on it!